The first type of meditation I practice is the standard “focus” meditation that is taught on headspace.com, and there are great walk-throughs there. I use tDCS to calm the conscious mind by placing the cathode on FpZ the center of the forehead and the anode at OZ center of the back of the head. I do this montage for 5–10 minutes, then remove the electrodes and meditate, focusing on my breath, for 10–15 minutes. I usually do this in the morning, and afterwards, I usually place the anode at FpZ and cathode on upper left arm and run the current for another 5–10 minutes. I find this is helpful in getting into work mode. via tDCS + Meditation — tDCS and Neurodynamics — Medium. User x0rn just posted this to the tDCS SubReddit. Check original source (link at bottom) for updates. Please share more if you have them. I’ll add to the list. 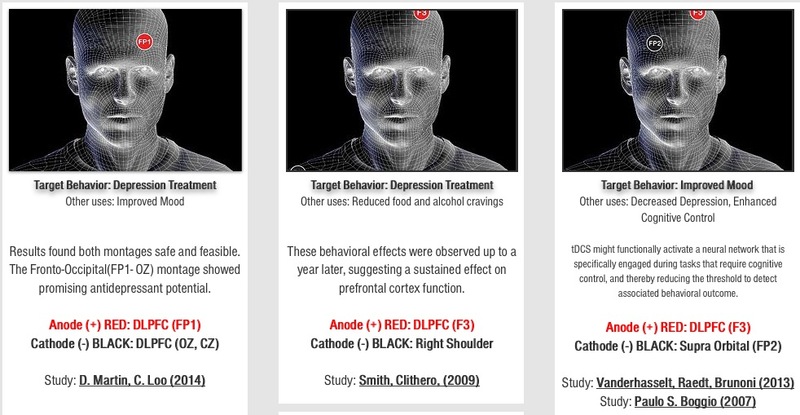 1 Source article was indirectly talking about using tDCS to map social interactions. 2 The author used theta-tDCS which seems to induce theta waves unlike traditional tDCS. via Simple Montage list with electrode placement and research sources. : tDCS. Jesse interviews Nathan Whitmore, creator of the open-source project OpenBrainStim, an affordable alternative to commercial transcranial Direct Current Stimulation (tDCS) devices. Nathan tells us how the project got started, how the “DIY-tCDS” community has grown, and how you can experiment from the comfort of your own home. via Do-It-Yourself Transcranial Direct Current Stimulation – Smart Drug Smarts. Brent Williams of SpeakWisdom just published a checklist for DIY tDCSers. Links at bottom to full list. via DIY tDCS Safety Standards | SpeakWisdom. Regarding the transients at turn on, that is a circuit issue. So to remedy, it is easy to add an LC filter at the output see picture below for new schematic. The LC filter acts to dampen any transients. Bench testing shows the ramp up to be 500ms, which is plenty to dampen any turn on pulses, but unfortunately not enough to prevent any flash that occurs with certain montages. At mouser.com, the L can be 22R105C and the C can be UKL1E100KDDANA. via Insight, a growth project driven by tDCS: A little less Simple DIY TDCS circuit using CRDs. Yesterday i was building some tDCS with LM334 and try for first time use ramping capacitor. When i test device with load (5KOhms) all was ok ramping when i turn device on and ramping down when off. But when i change load (5kOhms potentiometer) during stimulation (testing) it create current peak up to 5 mA. I test it with few different capacitor and behavior is always the same (only different value of peak and the time to return to normal ). Device without capacitor work without problem. In result of this i use instead of capacitor serial load ( linear potentiometer 100kOhms ) allows me to do manual ramping (0,07mA to setup current). My question is can anybody test this capacitor problem maybe i do something wrong, bad multimeter etc.. . If this problem is real, it’s a very bad idea to use capacitor for ramping in use the resistance change is not too quick but still can cause pretty high current peaks. Above is a schematic for a simple tDCS circuit that will supply 1mA. 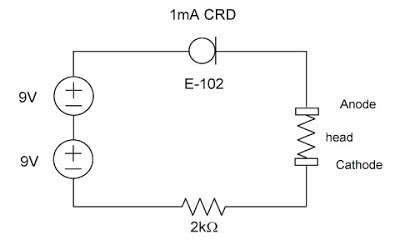 The CRD (E-102) maintains a 1mA regulated current to the head (between the Anode and Cathode). The E-102 can be purchased at www.mouser.com. Two 9V batteries are better than one, particularly if you have a less than perfect electrode-head interface, and it will last much longer without the need to change the battery; also the CRD has a 1V-2V drop so the full battery voltage is not present at the Anode. In using the CRD, you have a two pin regulator instead of a three pin regulator and a resistor for the LM334, which means simpler construction. 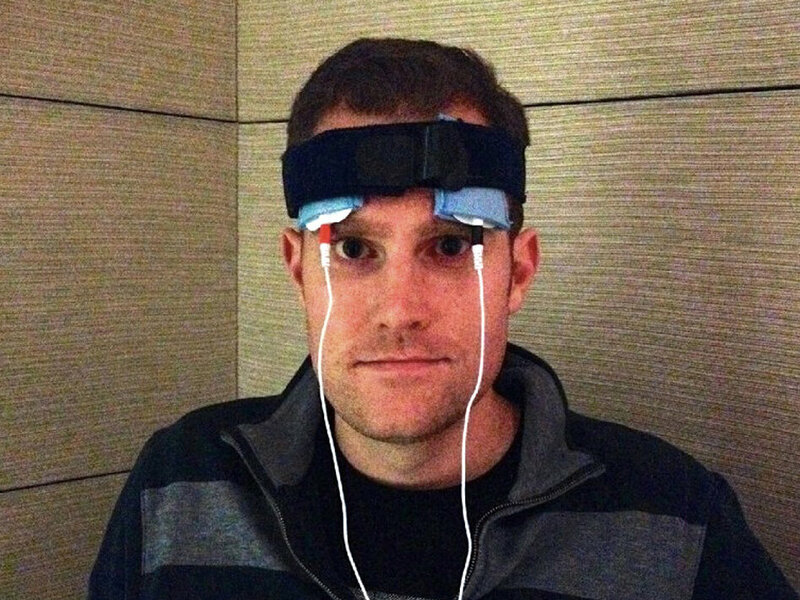 via Insight, a growth project driven by tDCS: Simple DIY TDCS circuit using CRDs. and use a resistor-based device. Brent mentions that upcoming videos will demonstrate how to build a current-regulated device.